"The world shall hear from me again." When Christopher Lee agreed to portray Sax Rohmer's popular Emperor of Crime in this, the first of what became five adventures for producer Harry Alan Towers, he was graduating to the role in a couple of different ways. 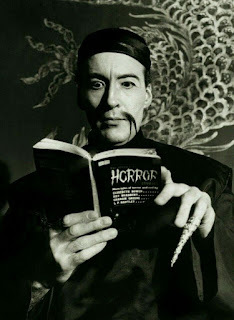 Firstly, he was stepping away from his essential homebase at Hammer Films to extend his range of portrayals of the great roles in horror and fantasy, having already played Frankenstein's creature, Count Dracula, and the Mummy - and in doing so, he was extending his reach as an international actor, as the film was to be an international co-production between Towers and Constantin Films of West Germany, who would ultimately release their own different cut (with a different score, to boot), Ich, Fu Manchu ("I, Fu Manchu"). 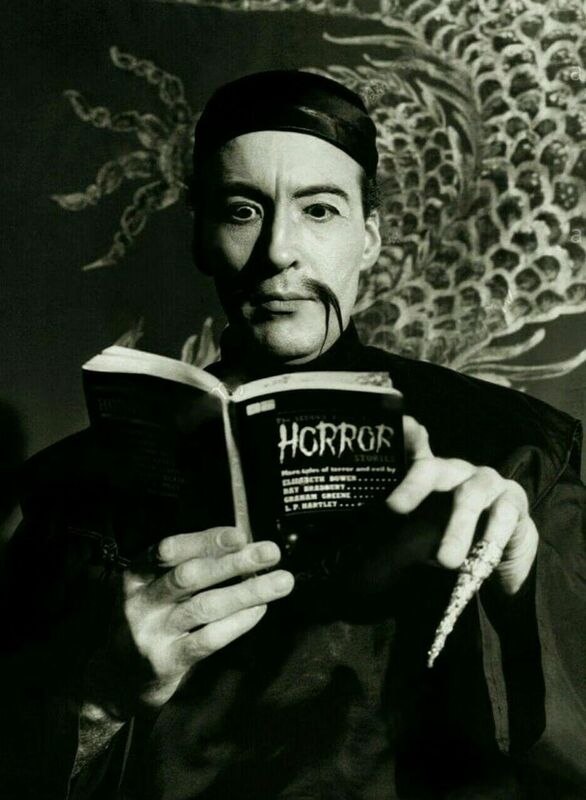 Furthermore, he had already approached this role from two oblique angles; one might even say he had auditioned for it, by having played a very similar character, Chung King, in TERROR OF THE TONGS (1961) for Hammer, as well as Ling Chiu, the Chinese detective in THE DEVIL'S DAFFODIL (1961), a krimi made for West Germany's Rialto Film, the home of the celebrated Edgar Wallace thrillers. It was here that those two lines had to converge. 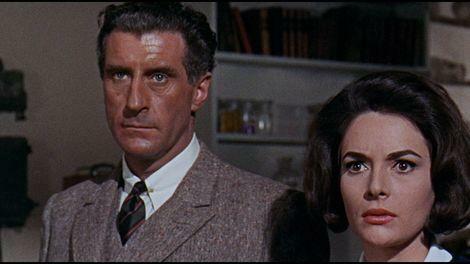 Nigel Green and Karin Dor. This first entry in the series opens with the ceremonial decapitation of Fu Manchu for his crimes, with his nemesis Sir Nayland Smith of Scotland Yard (Nigel Green) in attendance - an impressively ceremonial yet understated pre-credits sequence that underlines Lee's entrance with the flicker of light that precedes approaching thunder and concludes with the rain finally breaking and pouring down on an open courtyard abandoned by all save his headless body. The script by Peter Welbeck (Towers' pseudonym), based on no particular Rohmer novel, borrows a cliffhanger from the first Fantômas novel by Pierre Souvestre and Marcel Allain to explain the villain's resurrection: he hypnotized a great Chinese actor into taking his place on the headsman's block. Then, we're off and running in a new plot, which concerns Fu's cold-blooded quest to acquire the research that has gone into the development of a new mass-murder drug distilled from the seeds of the black poppy. In a scene recalling the early scenes of VILLAGE OF THE DAMNED, Smith and his associates Dr. Petrie (Howard Marion-Crawford) and Carl Jannsen (Joachim Fuchsberger) visit a small town that has been used as an example of Fu's power, and the camera lingers mercilessly over the images of women, children, and animals who dropped dead in the street. Like Father, Like Daughter: Tsai Chin and Christopher Lee. Jannsen is engaged to Maria Muller (Karin Dor), the daughter of the scientist (Walter Rilla) working in this area of research, who must be abducted and threatened with torturous death to get him to do what is wanted. It's a pleasure to see Fuchsberger and Dor, the stars of the Wallace krimis, acting together in English and they both figure in outstanding suspense scenes. Tsai Chin also makes a strong impression as Fu's sadistic and diminutive daughter, Lin Tang - whose name was Fah Lo See in the novels; she subsequently became a Bond girl in YOU ONLY LIVE TWICE (1967). Her father has the power and authority, but she is shown actively working in the trenches of crime, disguising herself and chomping at the bit to deal out more punishments. In short, she seems potentially the more formidable foe, though she would never transcend her increasingly sullen, second banana status. Director Don Sharp (KISS OF THE VAMPIRE, DEVIL-SHIP PIRATES, WITCHCRAFT) directs the film capably and without a hint of self-consciousness or humor, and the vaguely defined period setting is well-sustained. There is a sense about the film that it might have been whittled down from something of more epic length - there are references to key scenes glossed over or not shown - but it moves along at an able, indeed variable, pace that holds one's interest. The one source of disappointment is the score by Christopher Whelen, which seems present only to punch-up the action scenes, doing little to inject the film with identifiable flavor and personality. In this department, the film might well be improved upon by the German version (even shorter), which was rescored by Gert Wilden and is available as part of a comprehensive 5-disc box set released in Germany. In case you're wondering, the film efficiently shrugs away any quarrel about this escapist material's inherent "racism" when one character's color-conscious observation is shut down by his companion's wise and friendly admonition: "It takes all kinds to make a world." Available as a DVD-R from Warner Archive, with no extras. It's actually your best bet. Various import options exist, including a British DVD box set including the sequels THE BRIDES OF FU MANCHU (1966) and THE VENGEANCE OF FU MANCHU (1967) which includes bonus trailers; however, the quality of this version leaves much to be desired, looking somewhat noisy and overbright - evidently a not-very-skilled attempt at overcoming the limitations of 2-perf Techniscope. (c) 2018 by Tim Lucas. All rights reserved.